Gypsy Hill – “The Beast from nearby the Middle East” – proudly declare themselves to play ‘an intoxicating mix of balkan brass, mediterranean surf rock, ska and swing’. I’ve always been a bit suspicious of anything that smacks of ‘world beat’ or ‘global fusion pop’, so I wasn’t sure what to expect when the demo of the South London punsters’ latest album – even more hippyishly titled Our Routes – appeared in my inbox last week. Good thing, then, that I was pleasantly surprised as soon as I plugged in my speakers, turned up the bass a couple of notches, and put on the first track. As unlikely as it sounds, the combination of Balkan brass, ska, and scratch turntables actually works. Perhaps it’s not actually so surprising after all: trumpet flourishes transplanted straight from Guča replace the standard stabs and shout choruses of the horn section, while the simultaneously super-tight but langorous trombone glissandi punctuating numbers such as ‘Afrita Hanem’ bring to mind Rico Rodriguez’s contributions to The Specials’ hits from the early ’80s. 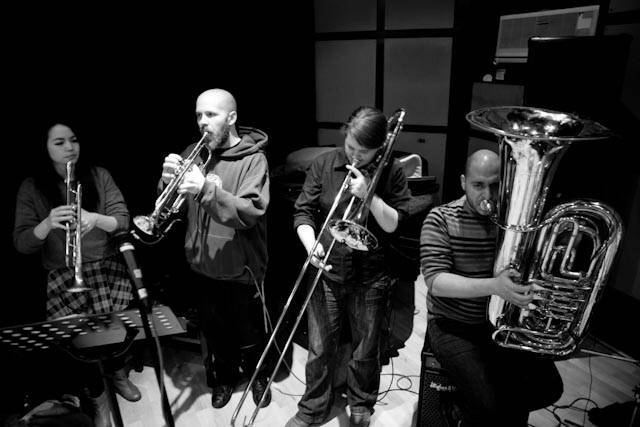 The Balkan-brass-plus-beats combo is pretty tried and tested as well: it’s just like Boban Markovic, O.M.F.O., or the whole Belgrade turbofolk scene, except that these guys have brought it back via Brixton and taken it a couple of steps further. Just when you start to think the whole assemblage was running pretty smoothly but in danger of turning into (albeit superlatively good quality) party background music – a criticism I’ve always had about Ukranian/Dutch producer O.M.F.O.’s album Trans Balkan Express, which I’ve never been able to listen to with a completely straight face since I was first exposed to it as a teenager as the soundtrack to Borat – in comes something completely unexpected yet somehow never gratuitous or out-of-place. Take, for example, the folk singer interrupted by grungily overdriven solo guitar at the opening of ‘Pachupa’, the electroswing-esque walking bass (tuba) line which kicks off ‘Swing 78-81’, or ‘that’ vocal sample (“The music just turns me on…”) which nobody on earth can remember the source for. So while I wasn’t completely won over by the album’s title or the accompanying blurb, and while I could quibble if I wanted to about the fact that the mix highlights the guitars and DJ samples a little too prominently at the expense of letting the brass bite through sufficiently, this has to be one of my best finds of the last year. If we’re being really pretentious, we could maybe describe Gypsy Hill’s style as something like ‘post-Balkan’ or ‘post-electroswing’: the result of a new generation of musicians who’ve absorbed all the niche musical genres that have been floating around on the London music scene for the past ten years, and produced something which pays homage to them while being totally fresh and new. Perhaps more importantly, though, Our Routes is a brilliantly put-together album, intelligent and original, and riotously good fun while still managing to be more than that. Anyone who’s in London later this week should definitely make it to the launch party at Passing Cloud in Dalston on Thursday 11th September (free entry); if you’re not able to make it, the album is available for download or to order on CD.